Brand New GR60-HD "HEAVY DUTY" Log Grapple with R12 Hydraulic Rotator Head. This is the Heavy Duty Version of the GR60 Grapple & R6 Rotator. * The end of a Logging Trailer articulated Boom. * The end of a Backhoes Dipper Stick. * The end of a Boom mounted on a Front End Loader. * The end of a Boom mounted on Skid Steer Loader Arms. * The end of a Boom mounted on a Tractors 3 Point. * Comes complete & ready to install including hoses & fittings as shown in photo! 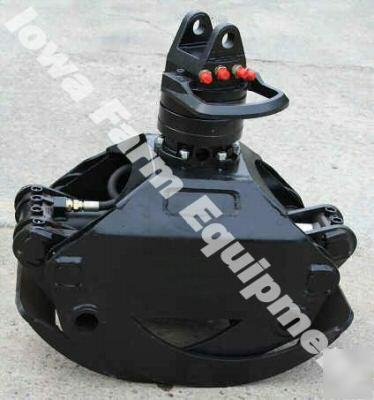 * Your Tractor or Skid Steer will need Dual Hydraulic Remotes. * Maximum Gripping width is 60-1/2". * Minimum Opening is 3-1/2" ! * Max Lift Capacity is 6600lb's. * Height in the open position is 38-3/8". * Height in the Closed Position is 23". * Width of the widest Claw is 17-1/2". * Working Pressure Rating is 3625psi. * Grapple weight is 550lb's. * Rotator Head is CONTINUOUS in Both Directions!!! * Maximum Load is 26,400lb's!!! * Max Working Pressure is 4640psi. * Torque Rating is 1900ft lb @ 2900psi. * Pin Hole for attaching to Grapple Hanger is 1-3/8" Diameter.